The Midianitish women soon led Israel into fornication and idolatry. These surroundings exerted a polluting influence upon the Israelites. Their minds became familiar with the vile thoughts constantly suggested; their life of ease and inaction produced its demoralizing effect; and almost unconsciously to themselves they [p. 454] were departing from God and coming into a condition where they would fall an easy prey to temptation. It was not long before the poison had spread, like a deadly infection, through the camp of Israel. Those who would have conquered their enemies in battle were overcome by the wiles of heathen women. The people seemed to be infatuated. The rulers and the leading men were among the first to transgress, and so many of the people were guilty that the apostasy became national. "Israel joined himself unto Baalpeor." When Moses was [p. 455] aroused to perceive the evil, the plots of their enemies had been so successful that not only were the Israelites participating in the licentious worship at Mount Peor, but the heathen rites were coming to be observed in the camp of Israel. The aged leader was filled with indignation, and the wrath of God was kindled. Their iniquitous practices did that for Israel which all the enchantments of Balaam could not do—they separated them from God. By swift-coming judgments the people were awakened to the enormity of their sin. A terrible pestilence broke out in the camp, to which tens of thousands speedily fell a prey. God commanded that the leaders in this apostasy be put to death by the magistrates. This order was promptly obeyed. The offenders were slain, then their bodies were hung up in sight of all Israel that the congregation, seeing the leaders so severely dealt with, might have a deep sense of God's abhorrence of their sin and the terror of His wrath against them. Phinehas "hath turned My wrath away from the children of Israel," was the divine message; "wherefore say, Behold, I give unto him My covenant of peace: and he shall have it, and his [p. 456] seed after him, even the covenant of an everlasting priesthood; because he was zealous for His God, and made an atonement for the children of Israel." The judgments visited upon Israel for their sin at Shittim, destroyed the survivors of that vast company, who, nearly forty years before, had incurred the sentence, "They shall surely die in the wilderness." The numbering of the people by divine direction, during their encampment on the plains of Jordan, showed that "of them whom Moses and Aaron the priest numbered, when they numbered the children of Israel in the wilderness of Sinai, . 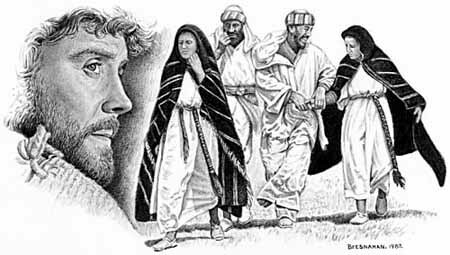 . . there was not left a man of them, save Caleb the son of Jephunneh, and Joshua the son of Nun." Numbers 26:64,65. "Now all these things happened unto them for ensamples: and they are written for our admonition, upon whom the ends of the world are come. Wherefore let him that thinketh he standeth take heed lest he fall." 1 Corinthians 10:11, 12. Satan well knows the material with which he has to deal in the human heart. He knows—for he has studied with fiendish intensity for thousands of years—the points most easily assailed in every character; and through successive generations he has wrought to overthrow the strongest men, princes in Israel, by the same temptations that were so successful at Baalpeor. All along through the ages there are strewn wrecks of character that have been stranded upon the rocks of sensual indulgence. As we approach the close of time, as the people of God stand upon the borders of the heavenly Canaan, Satan will, as of old, redouble his efforts to prevent them from entering the goodly land. He lays his snares for every soul. It is not the ignorant and uncultured [p. 458] merely that need to be guarded; he will prepare his temptations for those in the highest positions, in the most holy office; if he can lead them to pollute their souls, he can through them destroy many. And he employs the same agents now as he employed three thousand years ago. By worldly friendships, by the charms of beauty, by pleasure seeking, mirth, feasting, or the wine cup, he tempts to the violation of the seventh commandment. Satan seduced Israel into licentiousness before leading them to idolatry. Those who will dishonor God's image and defile His temple in their own persons will not scruple at any dishonor to God that will gratify the desire of their depraved hearts. Sensual indulgence weakens the mind and debases the soul. The moral and intellectual powers are benumbed and paralyzed by the gratification of the animal propensities; and it is impossible for the slave of passion to realize the sacred obligation of the law of God, to appreciate the atonement, or to place a right value upon the soul. Goodness, purity, and truth, reverence for God, and love for sacred things—all those holy affections and noble desires that link men with the heavenly world—are consumed in the fires of lust. The soul becomes a blackened and desolate waste, the habitation of the evil spirits, and the "cage of every unclean and hateful bird." Beings formed in the image of God are dragged down to a level with the brutes. It was by associating with idolaters and joining in their festivities that the Hebrews were led to transgress God's law and bring His judgments upon the nation. So now it is by leading the followers of Christ to associate with the ungodly and unite in their amusements that Satan is most successful in alluring them into sin. "Come out from among them, and be ye separate, saith the Lord, and touch not the unclean." 2 Corinthians 6:17. God requires of His people now as great a distinction from the world, in customs, habits, and principles, as He required of Israel anciently. If they faithfully follow the teachings of His word, this distinction will exist; it cannot be otherwise. The warnings given to the Hebrews against assimilating with the heathen were not more direct or explicit than are those forbidding Christians to conform to the spirit and customs of the ungodly. Christ speaks to us, "Love not the world, neither the things that are in the world. If any man love the world, the love of the Father is not in him." 1 John 2:15. "The friendship of the [p. 459] world is enmity with God; whosoever therefore will be a friend of the world is the enemy of God." James 4:4. The followers of Christ are to separate themselves from sinners, choosing their society only when there is opportunity to do them good. We cannot be too decided in shunning the company of those who exert an influence to draw us away from God. While we pray, "Lead us not into temptation," we are to shun temptation, so far as possible. Many of the amusements popular in the world today, even with those who claim to be Christians, tend to the same end as did those of the heathen. There are indeed few among them that Satan does not turn to account in destroying souls. Through the drama he has worked for ages to excite passion and glorify vice. The opera, with its fascinating display and bewildering [p. 460] music, the masquerade, the dance, the card table, Satan employs to break down the barriers of principle and open the door to sensual indulgence. In every gathering for pleasure where pride is fostered or appetite indulged, where one is led to forget God and lose sight of eternal interests, there Satan is binding his chains about the soul. Israel's sin at Beth-peor brought the judgments of God upon the nation, and though the same sins may not now be punished as speedily, they will as surely meet retribution. "If any man defile the temple of God, him shall God destroy." 1 Corinthians 3:17. Nature has affixed terrible penalties to these crimes—penalties which, sooner or later, will be inflicted upon every transgressor. It is these sins more than any other that have caused the fearful degeneracy of our race, and the weight of disease and misery with which the world is cursed. Men may succeed in concealing their transgression from their fellow men, but they will no less surely reap the result, in suffering, disease, imbecility, or death. And beyond this life stands the tribunal of the judgment, with its award of eternal penalties. "They which do such things shall not inherit the kingdom of God," but with Satan and evil angels shall have their part in that "lake of fire" which "is the second death." Galatians 5:21; Revelation 20:14. Click here to read the next chapter: "The Law Repeated"